Who says you have to bake desserts in the summer? 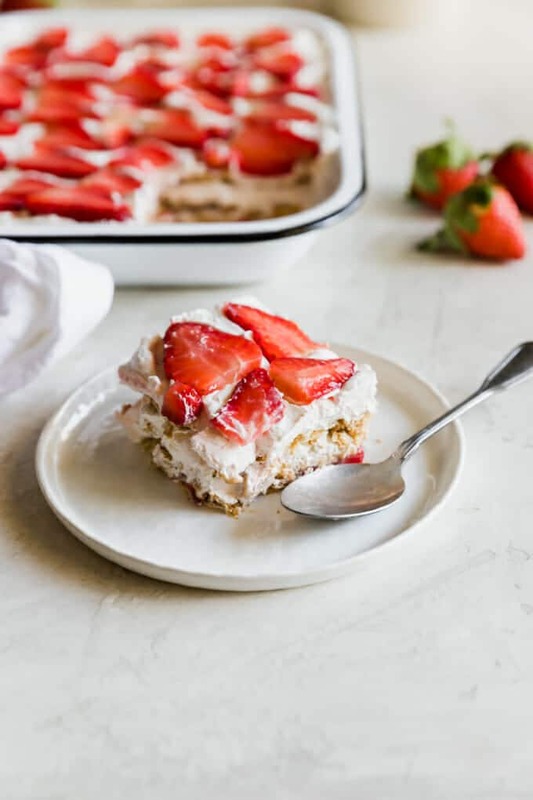 This Strawberry Icebox Cake is just what you need for a hot summer day dessert. I’ve been making Strawberry Pie for a long time, but honestly, I just recently found out about icebox cakes. I wasn’t one of the lucky kids to have them growing up so I had no idea they were even a thing. Layers of graham crackers, whipped cream and fresh fruit? Sign me up! Not only are they completely versatile, they look like you’ve been working hard in the kitchen. Icebox cakes also taste AMAZING. This very simple dessert has very simple ingredients. There’s nothing fancy about it and that’s the best part. You can make an icebox cake with any flavor combination and can even use wafers instead of graham crackers. All you need is 3 ingredients. Start by spreading whipped cream in a baking dish. Next, add a layer of graham crackers, then another layer of whipped cream and then fresh sliced strawberries. Repeat layering in that order until you get to the very top of the baking dish. Cover with plastic wrap and place in the fridge. The whipped cream and strawberries soften the graham cracker (not soggy soft) and it has such a great texture. 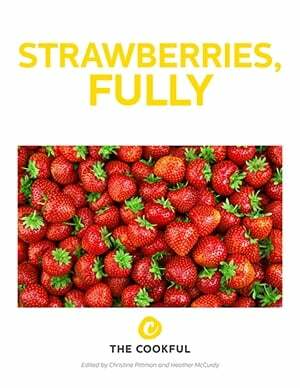 You get the nutty taste of graham crackers mixed with rich and creamy whipped cream and fresh juicy strawberries. THE BEST! This is your chance to impress your friends and family without ever turning on the oven. Do we even need to ask if you’re in? In a 9x13 baking dish, spread a dollop of whipped cream in the bottom of the dish then add a layer of graham crackers, using halves and quarters to fill in empty spots. 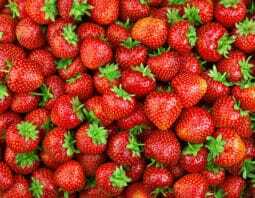 Spread a layer of whipped cream over the graham cracker layer then add a layer of sliced strawberries on top. 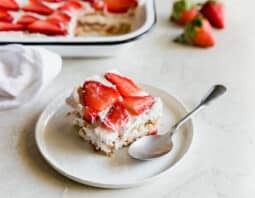 Top with a second layer of graham crackers, filling in any empty spots, then add a layer of whipped cream and another of sliced strawberries. Add a third layer of graham crackers then whipped cream and then sliced strawberries. Finally, add one last layer of graham crackers then whipped cream then sliced strawberries. Loosely cover the baking dish with plastic wrap and chill until set, approximately 3 hours or more. Cut and serve. Leftovers should stay fresh in the fridge for up to 3 days.